One of our SAR dogs is missing in McEwen, TN. She is one of the dogs who searches for Holly Bobo every other weekend. She is also the beloved pet of the children in the family. Please help us find our missing Malinois. She answers to Bunni and has a pink collar. She dug under the fence while the family was gone earlier and we have looked everywhere. She is a good dog. She is a little Nippy towards strange men. Hope Bunni has been found. Couldn't tell from the FB pages. Just found bunni. 6 miles from home. Thanks for everyone's help. She is about 25 pounds lighter than when she left but at the rate she is eating she will be back to normal in a day lol. She's all loved up on Lexi now. Mrs. Sullivan's pie company, based in Jackson, Tennessee, is running ads on its pie boxes featuring a picture of missing Darden, Tennessee nursing student Holly Bobo. The ad reads "Help!!! Please bring me home!," offers an $80,000 reward for tips, and displays the tip line (1-800-TBI-FIND). DECATUR COUNTY, Tenn. - The search continues for Holly Bobo after she disappeared from her Decatur County home in April of last year. On Saturday, rescue crews and several volunteers were out early Saturday morning until around 2 p.m., searching in a new area in Decatur County. Family members said they are still getting new tips every day, and will not stop searching. MEMPHIS, Tenn. - A West Tennessee man has offered $100,000 from his own pocket as a reward to regenerate interest in the Holly Bobo case. The Jackson Sun reported Thurstle Mullen of Memphis is offering the reward to help bring the case back into focus and give Bobo's abductor a reason to confess. Mullen said he will offer a reward of $25,000 up front to the person who turns himself in to the police in relation to Bobo's kidnapping. "It's not for ransom. This person must plead guilty and turn himself in. I'm willing to pay money to solve this crime," Mullen told the paper. Mullen said the remainder of the money will be deposited in a fixed amount depending on the length of the individual's prison sentence. It's so hard to believe that Holly hasn't been found. With so many facts about her disappearing from her outside the home and it being such a small town, how does someone fly under the radar from this? Two years ago Saturday, Holly Bobo disappeared into the woods behind her home in Darden, but Pastor Don Franks said he wants the world to know that Bobo’s family and the community have not given up on finding her. Franks, the Bobo family’s pastor, was one of nearly 400 people at the Keeping Hope Alive rally at the University of Tennessee Martin Parsons Campus on Saturday. She said they firmly believe that people in the community have information that they believe they may have already told authorities and the information got lost early in the investigation or they don’t realize the information they have could be of use. “Now is not the time to give up,” Beatty said, urging anyone with information to come forward either again or as new information. She explained that any little clue could be the one that leads them to Bobo. The press conference was followed by a balloon release where hundreds of pink balloons were sent into the sky. “Our prayer today is that these balloons will reach that individual that took Holly,” Franks said. He gave a prayer before everyone released their balloons. DECATUR COUNTY, Tenn. - April 13, 2013 marked two years since Decatur County nursing student Holly Bobo was kidnapped from her home by an unknown man wearing camouflage. "We want the entire world to know that we are not giving up and we still believe that Holly is alive," said Pastor Don Franks. Family and friends gathered Saturday with the community at UT Martin where Holly attended school. Residents said they are keeping hope alive and reminding others that their search is not over. Thanks for the updates Red! Holly Bobo's purse was found a mile from her home by a dog who dug it up. There is a massive search going on right now. TBI spokeswoman Kristin Helm said law enforcement officials were using search dogs in an area near Bobo's home. "Some neighborhood dogs yesterday found what appears to be Holly's purse," Helm said in an email. "We are trying to find where the dogs found the purse." When Bobo disappeared, authorities and volunteers conducted massive searches of the hilly, heavily wooded land around the home on foot, horseback and all-terrain vehicles. Helm said the area of the latest search had been searched by volunteers previously. No arrests were ever made in the case. Officials said they didn't consider anyone in the family to be involved in her disappearance and never identified a person of interest. Posted April 18, 2013 at 2:29 p.m. 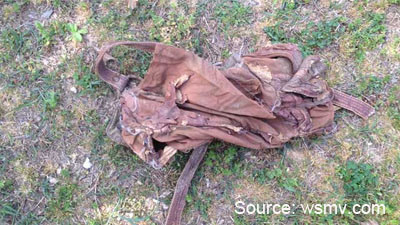 The bag matches the description of one she was carrying when she disappeared and there were items in the purse indicating it belonged to the young woman, said TBI spokeswoman Kristin Helm. “We don’t know where the dogs found the purse, but we have other dogs out there searching to see if they can find where they found it,” Helm said, adding that the area had already been searched several times. Tammy White, a close friend of the Bobo family, said Holly’s mother Karen hasn’t been allowed to see the purse yet and that, until that happens, they’re being cautious in their enthusiasm about a potential break in the case. “You’d like to believe that maybe it is Holly’s, but we’ve heard a lot of stuff that hasn’t been true so we have to just wait and see what happens,” White said. Page created in 9.54 seconds with 20 queries.